Video courtesy of Bob in Maryland. Enameled Blue and Gold Macaw Parrot perched on a branch keepsake box. The parrot is blue and yellow and is trimmed in gold and accented with crystals. Functions both as decor and for hiding keepsakes such as: rings, earrings and trinkets. Made of pewter and hand painted with enamel paint. It has a hinged lid with magnetic closure. Measures: 1.75" long x 1.75" wide x 4" tall. Elegantly packaged in satin lined gift-box. Capiz Trinket Box. This is an exquisite Capiz box. Capiz is a province in the Philippines that gets its name from the shell which flourishes copiously there. The shells at maturity are nearly flat and can grow to almost 6 inches. Capiz is made from the shell of the windowpane oyster. These shells belong to a bivalve mollusk that is found in the shallows of the Gulf of Aden, around India, Malaysia, the South China Sea and the Philippines. The colors are vibrant and the artistry is superb! Make great gifts or an addition to any collection. This is a beautiful hyacinth macaw box and the colors are incredibly bright and beautiful! Measures 3 inches by 3 inches and is approximately 2 inches high. With one-of-a-kind style, this bag is both trendy and convenient. Inside zippered wall pocket, 2 multipurpose pockets. Magnetic flap pocket with gusseted pocket in front. Small zippered wall pocket, slip-in cell pocket. Adjustable handle with drop 13.5"-26". 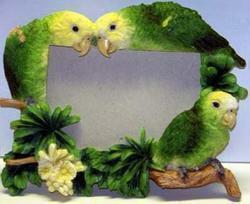 Beautifull handcrafted Intarsia wooden parrot Magnet. This is NOT a bird toy and not recommended for birds. Beautifull handcrafted Intarsia wooden parrot Keychain. This is NOT a bird toy and not recommended for birds. Beautifull handcrafted Intarsia wooden parrot ornament. This is NOT a bird toy and not recommended for birds. Good things really do come in small packages! This elegant mini tote is ideal for everyday use and special occasions, and can be carried elegantly in your elbow or slung casually over your shoulder. Hanging ornament. Made of glass. Comes in its own adorable gift box. The perfect gift for the bird lover in your life! Cockatiel is 5 3/4" long. Not a bird toy. Not bird safe. Clip-On. Made of glass. Comes in its own adorable gift box. The perfect gift for the bird lover in your life! African Grey is 4 1/2" long. Red Songbird is 6" long. Barn Owl is 6" long. Made of hard plastic. Comes in its own adorable gift bag. The perfect gift for the bird lover in your life! African Grey is 4" x 1 3/4"
Total width is 4" with heart. Cockatiel is 6" x 1 3/4"
Total "width" is 3 1/4" with ornament. Macaw is 5 1/2" x 1 3/4"
Total width is 3 1/4" with ornament. Amazon is 4" x 1 3/4"
Total width is 2 3/4" with heart. Keep your keys on hand and in style with these soft, padded beauties. Two open deep side pockets. 9" x 8.25" x 4.75" . Add art to every dimension of your life with this handy case. Keep it versatile with this vibrant smartphone case and wallet. Inside 12 CC holders, 2 ID windows, 2 slip-in multipurpose pockets, 1 full length bill pocket. Rear flap pocket for smartphone. Detachable shoulder strap with 24” drop. Designed for iPhone 6™, iPhone 6 Plus™ and similar phones. Made from the finest and softest leather, this slouchy shoulder bag features a free falling fringe that you’ll be tempted to run your fingers through. Inside one zippered compartment, one open pocket, two multipurpose pockets. Rear zippered compartment, slip in pocket. Removable cosmetic pouch and optical case. A true masterpiece to decorate your look, the flawless Anuschka® Handbags 636 Compact Crossbody with Front Pocket. Made of leather with handpainted detail. Detachable crossbody strap with chain detail. This product may have a manufacturer's warranty. Please visit the manufacturer's website or contact us at orders@mysafebirdstore.com for full manufacturer warranty details. This hand painted leather hobo style shoulder bag is a natural beauty. Holds wallet, cosmetic case, sunglasses and personal technology. Dimensions: 9 1/2" wide x 4 3/4" deep x 8" high. Single shoulder strap. Shoulder drop: 13" length. Back exterior zip pocket and side exterior slip pockets. This product may have a manufacturer's warranty. Please visit the manufacturer's website or contact us at orders@mysafebirdstorel.com for full manufacturer warranty details. Anuschka Large Handpainted Leather Wallet Clutch Rainforest Royalty is created in mind for a girl who loves the uniqueness, easy-going style and to be like no other while sporting her love of birds! The supple pebbled genuine leather bag is finished with stylish topstitching. Like no other, a unique Anuschka® handbag is sure to distinguish your look. Made of exquisite hand-painted leather. Interior features a back-wall zip pocket and two slip pockets. Beautiful African Grey Mates t-shirt. Beautiful African Grey Mates ceramic mug. 15oz design and what a way to put a smile on your face on Monday Morning. Dishwasher and microwave save. Buy two - one to use and one to display with your all of your bird "parrotphernalia"
Beautiful Greenwing Macaw Mates t-shirt. Beautiful Greenwing Macaw Mates ceramic mug. 15oz design and what a way to put a smile on your face on Monday Morning. Dishwasher and microwave save. Buy two - one to use and one to display with your all of your bird "parrotphernalia"
“Changes in latitudes, changes in attitude!” This Margaritaville margarita glass will inspire a positive change, hand painted with a tropical scene and a very laid-back parrot. Margaritaville combines the artistry of Jim Shore with a whimsical Santa at the beach with his blue & gold macaw, enjoying a holiday cocktail. Margaritaville combines the artistry of Jim Shore with playful, beach inspired images from the music of Jimmy Buffet. This laid back Parrot sits atop a whimsical stacked scene featuring "Changes in Latitudes, Changes in Attitudes." We invite you to spend your Holidays in Margaritaville… Aaaahhhh the sound of the ocean, the sand between your toes and the drink in your hand. Bring the spirit of the good life to your Holidays by decorating in Margaritaville style. Measure: 5 in H x 2.25 in W x 2.5 in L.
Bird People and fans of Margaritaville will love this exclusive licensed Parrothead product! Great gift for that crazy bird person in your life! Gift boxed 16oz mug is dishwasher and microwave safe. Margaritaville combines the artistry of Jim Shore with playful, beach inspired images drawn from the music of Jimmy Buffet. Catching a wave, this Parrothead Party is a surfer’s delight. Glass artwork hand-crafted in the USA by Artists Kimya Bolton and Thomas von Koch. Click the picture to see the artwork in better detail and to learn more about the artists. Green Macaw is approximarely 5" long, with a wingspan of 4" wide. Comes with silk ribbon and monofilament for hanging. Beautiful! Red Macaw is approximarely 5" long, with a wingspan of 4" wide. Comes with silk ribbon and monofilament for hanging. Beautiful! Cockatoo is approximarely 3 1/2" long, with a wingspan of 2" wide. Comes with silk ribbon and monofilament for hanging. Cockatiel is approximarely 6 1/2" long, with a wingspan of 5" wide. Comes with silk ribbon and monofilament for hanging. African Grey is approximarely 3" long, with a wingspam of 3" wide. Comes with silk ribbon and monofilament for hanging. This decal is printed on a quality outdoor grade vinyl stock with an adhesive backing suitable for vehicle use as well as most other smooth flat surfaces. The inks are UV stable and designed to perform without fading for several years under normal outdoor environmental conditions.